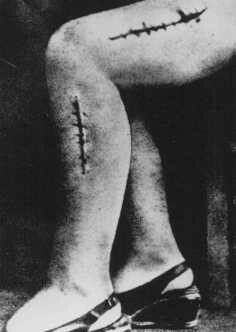 A war crimes investigation photo of the disfigured leg of a survivor from Ravensbrück, Polish political prisoner Helena Hegier (Rafalska), who was subjected to medical experiments in 1942. This photograph was entered as evidence for the prosecution at the Medical Trial in Nuremberg. The disfiguring scars resulted from incisions made by medical personnel that were purposely infected with bacteria, dirt, and slivers of glass.